We are so excited about the Craft and Hobby Association Show starting this weekend in Anaheim, California! 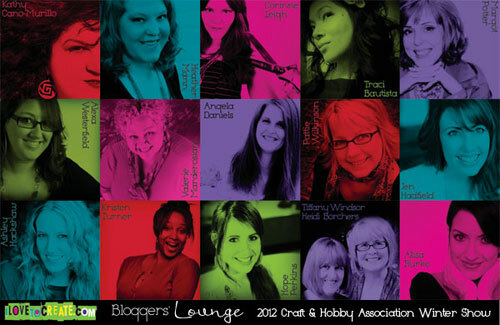 In addition to our amazing show booth, we are really ecstatic about our iLoveToCreate® Bloggers' Lounge! We've been planning this event for over 3 months and we are so glad we can finally share the news with you, our friends and fans!! The Bloggers' Lounge (booth #1818) is going to be the coolest spot at the show...we are offering up a fun and crafty badge make and take with some of the hottest bloggers in the craft and DIY industry! We'll also be serving up some super crafty refreshments and offering recharging stations for attendees to charge up their phones and tech gadgets! Here's the lineup of the bloggers who are attending! 1:30PM – 3PM Margot Potter, The Impatient Crafter, Craft.You. We'll be sharing regular updates on our blog, Facebook page, Twitter, and Youtube pages throughout the show so you can stay connected even if you're not at the show! CANNOT WAIT!, TILL U COME TO Michigan!!! Wish I could be there! Maybe someday.